Power BI is a relative new set of tools and services from Microsoft that help you visualize data in a few clicks. Internet of Things (IoT), Smart Machines, Big Data & Cloud as well as Analytics have all been identified as mega trends to watch on Gartner’s 2015 Hype Cycle. High quality tools like Power BI Desktop and services to analyze these large data-sets will become more and more important. 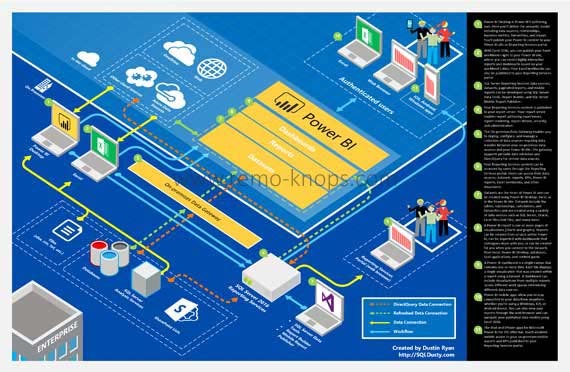 The Power BI Architecture Diagram, created by Dustin Ryan -a Data Platform Solutions Architect with Microsoft interested in Power BI, SQL Server, SSAS, & Azure-, shows best how the collection of software services, apps and connectors work together. Most important Power BI components are discussed in the upcoming sections below. The Power BI service is cloud-based business analytics service that is “integrated” with your Office 365 account as soon as you sign up. You can access it from the upper left corner in Office 365 or simply browse to Power BI homepage and hit the sign-in button. In the Power BI Service you have a navigation menu on the left that consists of a persona workspace. 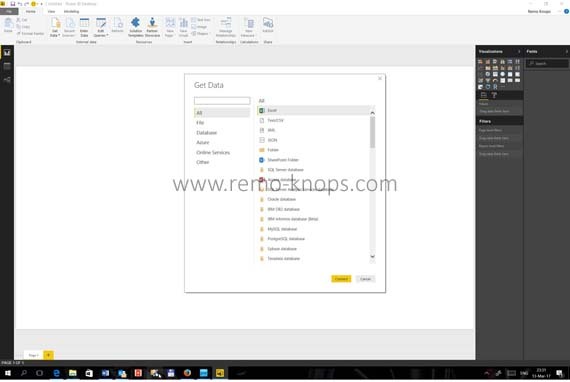 In this workspace you see the three layers/levels in Power BI. You connect to different data sets and you build reports based on these multiple data sets. You can create a dashboard with visuals to keep track of the most important report parameters. 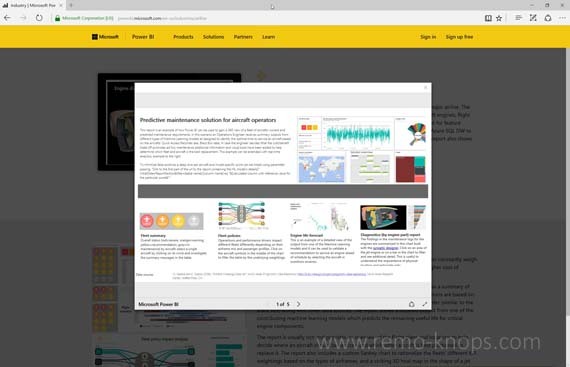 The service connects with Power BI desktop and the mobile client. You can use the familiar Microsoft Office 365 sharing and group features from the service. For me Power BI Desktop is the central tool where you connect to data sources and create your visualizations, measures and models. In a monthly update cycle new features are added to the Power BI Desktop. In the Power BI Desktop Documentation section you can find out “What’s new in the latest Power BI Desktop update?” and “Previous monthly updates to Power BI Desktop”. Power BI Mobile is a rich client application for your smartphone, that helps you easily keep track of your reports and kpi’s on the go. I have personally used the Power BI mobile clients on Android and Windows Phone. As mentioned the Power BI mobile client is perfectly for looking up and checking in, but creation of interactive reports is best in the Power BI Desktop application. The Power BI gateway is a little application that you install on your local machine, and where you login with your network/office 365 credentials. The Power BI gateway helps you to perform scheduled refreshes of data, reports and visualizations when your laptop is online. Most interesting is the solutions section on the Power BI website, because it shows examples of the Power BI features for various industries. All the examples are clickable and show real-time drill-downs in the data and visuals. The industry solutions give you an idea of what data solutions are available for each industry. As you can see that the solutions have a wide variety from predictive maintenance for a major airline to demand forecasting within the energy sector. Of course you will also see various financial solutions, that would come first to mind when thinking about visualizing data. The other solution section is about department solutions, that are “independent” of the industry or company type. For these departments you will see 3 or 4 department specific solutions from operational store performance to headcount summary to marketing campaign analytics. 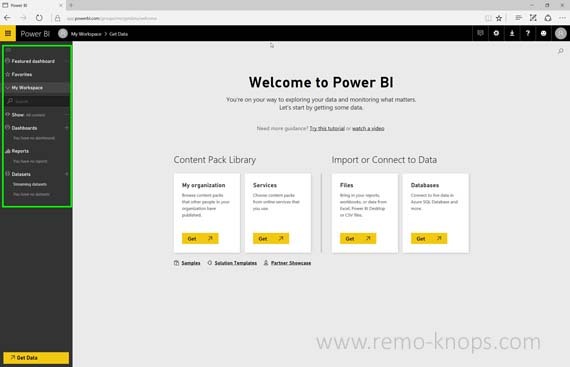 Power BI is an easy to learn tool- and services set that is available as a Power BI free service and a Power BI Pro service. The price-point of Power BI Pro is € 8,40 per user per month. The main differences between Power BI free and Power BI Pro version are in the collaboration options and the data refresh options as you can see in the overview of the Power BI pricing page. Power BI gives you the ability to create visualizations within minutes, where this takes a lot custom work within Microsoft Excel. Microsoft Power BI is particularly helpful for a Business Analyst who likes to continuously improve processes and schedule recurring reports. However as the department solutions have shown, many professionals could benefit from using Microsoft Power BI to keep an eye on their KPI’s. Personally I’ve done an excellent edX Course DAT207X – Analyzing and Visualizing Data with Power BI. The advantage of this course is the combination of theory and lab assignments that force you to work with the data and try the different features. Also check out the Power BI Publisher for Microsoft Excel article. Hey!, I found this information for you: "Power BI – Visualize your data". 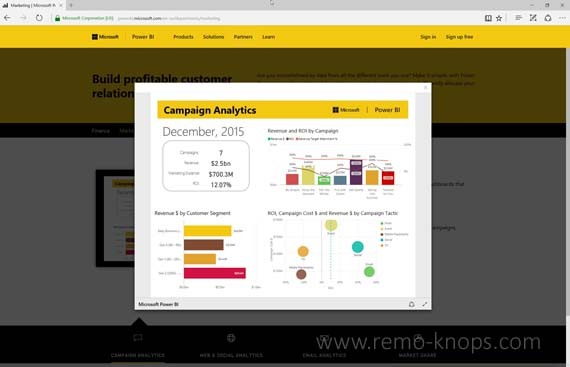 Here is the website link: https://www.remo-knops.com/5203/power-bi-desktop-visualize-data/. Thank you.